Gas-powered weed eaters are burly enough to chop down the thickest underbrush, no doubt. But they're also noisy, smelly, and expensive to run. Instead, take the CGT400 Trimmer from CORE GasLess Power for a spin. A lightweight dual-line electric trimmer that runs on a Li-ion battery pack rather than an extension cord or a two-stroke gas engine. People that don't want to pay for premium octane just to edge their lawns. It looks like a normal weed eater with the spinny, choppy bits at one end, a grab bar and trigger in the middle, and the power source counterbalancing the back end. The CGT400's power cells slides into the rear of the power supply housing while the trimmer end can be swapped out for a hedge trimmer or blowers (though I didn't test them). Assembly was a breeze, just slide the trimmer attachment into the front end of the battery housing and tighten the clamp. Then charge up the Li-ion battery pack, slide it into the rear of the power supply, and you're ready to go. At 11 pounds, the trimmer is very light, on par with my rinky dink corded model, and consequently very easy to handle. The .095 line is tough enough to handle most grasses and non-woody weeds. It's certainly better than the .065 my other electric trimmer wields. While corded trimmers of course have the runtime advantage, the CGT 400's 45 - 60 minute runtime is more than adequate for the average (sub)urban yard. I don't have any exterior power sockets in my back yard so I used to either have to run an extra 20 feet of cord to the middle of my garage to plug in my corded trimmer or spend an extra 15 minutes swearing at my gas trimmer as I tried to get it started. This is the best of both worlds. The CGT400 gives me the mobility of a gas trimmer without the worries of eating through an extension cord as well as the operational time of and comparable power to a gas engine without the throat-choking oil-gas exhaust. Even as Li-ion cells go, this battery pack is cumbersome. Expect to dedicate at least a square foot of toolbench to the charging station. Even though the entire rig is just over 10 pounds, the option for a shoulder strap would have been nice. Can also be outfitted with a pair of blower attachments and a hedge trimmer. The battery pack charges completely in about three hours. Granted, the CGT 400 is a bit more expensive than other cordless models—say the Black and Decker 18V—the ability to swap out the spinner head with other power tools is very handy. 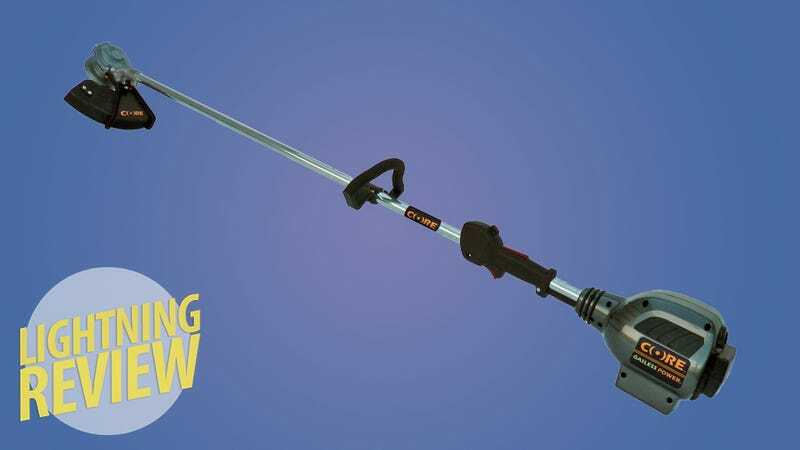 And unless you're trailblazing through waist-high weeds or trying to clear acres of land, this sturdy and dependable cordless trimmer is up to the task.